I’m something of a board game geek, so I get a kick out of seeing something with a physical presence recreated in app form, and while I’ve never played the original, Treasure Fleet is based on an actual card game created by the same company, Ship of Fools Games. 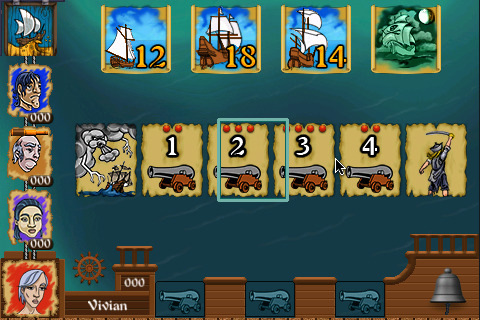 Treasure Fleet is a fast-paced strategy card game. You compete against three computer opponents for control over a number of treasure ships, all worth different amounts of treasure. Everyone starts out with the same number of attack cards and one special boarding party card. On your turn, you spend a card on a ship, and a card is gone forever once spent. Whoever spends the most attack points on a ship gets the treasure. The boarding party card lets you automatically take control of a ship, but you only have one, and if someone else plays their boarding party on the same ship, nobody gets it. Whoever has the most treasure at the end of four rounds wins the game. On the surface, the game is pretty straightforward, but there’s a ton of strategy involved, even on the easiest level. To complicate matters further, the card you have leftover at the end dictates who captures the governor, who is worth a significant ransom bonus. In a lot of ways, the game almost feels like a high stakes auction, except everyone starts with the same amount of money, and you still have to pay if you lose. The help section is a little rough though, so it might take you a little while before you finally get the hang of things. From an aesthetic point of view, Treasure Fleet does a great job of pulling in interesting artwork, a clean layout, and super music. I was fairly disappointed that you could only play against the computer, but it does look like that’s on the slate for future updates, along with more character customization, which I would love to see. It took me awhile to get used to, and I’m still not very good, but Treasure Fleet is definitely a solid and affordable little game. If you really like the game, there’s also a code to get you a discount on the physical card game, which I thought was a clever marketing tactic, as its easy to see how the card game would be just as enjoyable. For an app port of a physical game, Treasure Fleet is remarkably polished and does a great job of taking advantage of the digital medium instead of just recreating the card game on a virtual table. It may not be the best card-based game out there, but Treasure Fleet is definitely worth a peek if you’re into board games. AppSafari review of Treasure Fleet was written by Tracy Yonemoto on May 11th, 2010 and categorized under App Store, Games, Strategy. Page viewed 3103 times, 1 so far today. Need help on using these apps? Please read the Help Page.